Everyday from 9:00 a.m. to 12:00 a.m. 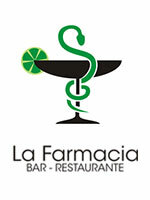 In a corner of Callejón de los Peluqueros, La Farmacia (The Drugstore) aims to heal your desire of a good meal. In a pleasant environment, you may choose between the indoors and outdoors experiencies, where the test tubes are part of the décor reminding the previous uses of the building while at the same time, a well provided bar reassures the present use. The Mojito of this house is certified by Havana Club, you can combine the dish of your choice with the perfect beverage.